Well, December 13th was a good day for me. It was my birthday – had a great time with my family and a chocolate peanut butter pie! Google also announced the option to pay for conversions with display campaigns. For many, this is a welcome new bidding feature that may encourage people to re-examine how they run display campaigns. Many advertisers tend to use display more for branding/awareness or micro-conversions (think e-mail sign ups or increasing your pool of people for remarketing). Having said that, display campaigns have proven to be a good way for some advertisers in different industries to generate direct conversions. But, I think most advertisers begin with search campaigns as a means to drive direct leads and sales. Before this new pay per conversion was an option, you could use pay per click (or impressions) with display campaigns. With pay per click you pay every time someone clicks on your ad. You also have the option to set a target cost per action (CPA). When you do this, Google will use automated bidding strategies to try and hit your target CPA. So, if you set a target CPA of $50, Google will try and hit that target. In reality, this is hit and miss. Just because you set your target CPA to $50 does not mean that is what is going to happen. Your actual CPA could be lower or much higher. Google simply has a target to try and hit. That last part is especially interesting. You’ll never pay above your target CPA. Pretty cool. However, don’t go thinking that you’ll be able to set a ridiculously low CPA and watch the conversions continue to role in. Let’s say you currently get conversions from your display campaign at about $50 each. You’ve been in that ballpark for a while and you’ve been testing different ads and optimizing it the best you can. If you go and choose the new conversion-based bidding option and decide to set your target CPA at $5, you’ll probably be disappointed. If you set your target CPA unreasonably low (relative to what you have already proved you can get conversions for) you’ll probably experience a drop in click & impression volume. Google is now trying to hit your new and very low CPA target. Something has to give in order to try and hit that target. Most likely, volume is going to give way. If Google continued to show your ads at the same rate they did when your target CPA was $50 (and they were getting paid for every click!) they would lose money with their ad inventory. It simply would not make financial sense for them to keep this same level of ad volume when your new target CPA is $5 (and, they no longer get paid for clicks). But, this is why you test. Let the data have the final say. 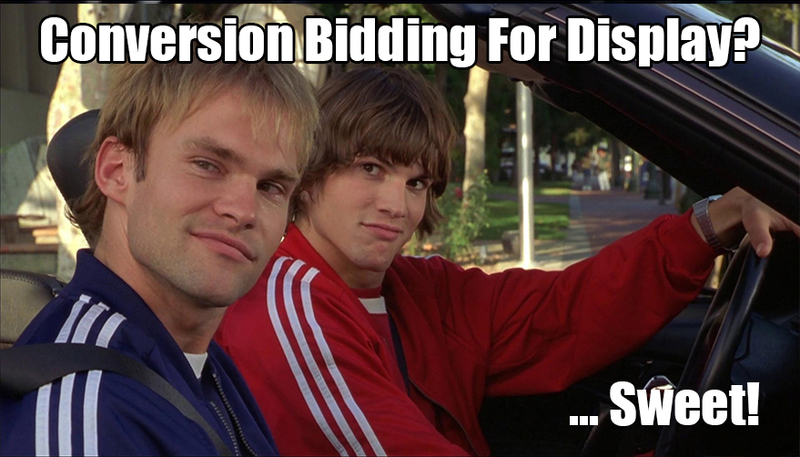 If you bid for offline conversion types, then your account will not be eligible for conversion bidding on display. If you use shared budgets, it does not work.